Love this look! Yellow looks gorgeous on you and those DVF wedges are to die for! Love this dress, the colour fits perfect to you! I love all these bright colors! So jealous of your tropical looks as I”m sitting here in sweaters! 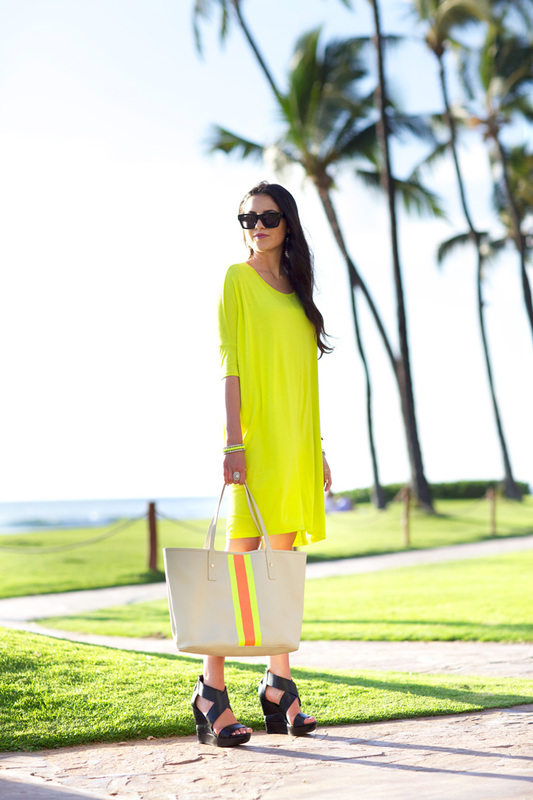 this neon dress looks bautiful on you! the neon dress looks beautiful on you! Love the bright yellow on you – so pretty and fabulous heels, too! Of course it was a compliment. You look great! this is lovely! those heels are fab! Gorgeous look, love the color and the bag. Love the bight color of this dress! hahaha! yes, a little bright but its perfect for the beach I guess and the tote is beautiful! This dress is adorable and seems perfect for summer! I had a quick question about it though- How see-thru is it? Would you need to wear something under it? I just want to make sure because I’m 10 seconds away from hitting the “Buy” button. What a sweet and supportive husband! In love with these wedges. I remember seeing them on Shopbop and regret not buying them! This is a great look for the beach! Such a fun color! i love all of the accessories! that bag is so cute and the jewelry is stunning! Great color to put on while you have a tan and are on vacation. Beautiful pictures. I love this look! How I wish I could be wearing a nice summery look.. meanwhile we’re in the middle of a snowstorm here in New Jersey. I need to go back to Hawaii! xo! haha husbands are the best! their quotes on fashion are just priceless sometimes and i would definitely take that as a compliment. also, you should be sure to tell your husband that he is doing a wonderful job, your pictures are always incredible!!! Lovely bag and beautiful background on all of your photos! Another bright look! I love it! Bold + Beautiful!! Love your blog – I notice you often wear bold lipstick… Have you ever done a blog post/tutorial on how to apply lipstick so it lasts all day? Thanks and keep the awesome fashion coming! Lol men and fashion, always funny! Love that bright yellow dress, so fun and cute! Rach, I am LOVING all of these bright colors you’ve been wearing lately! This dress is so cute! LOVE this dress and ordered it for my trip to Naples this spring! How see-through is it? Not sure if I should pack a slip or not if I’m going to wear it out as a dress (as opposed to a beach cover-up). You could get away without wearing a slip but I would probably pack one :) Have so much fun on your trip, sounds incredible!!! Hi! I’m a graphic designer and I’m currently working on a blog. I was asked to create the scrollbar you (and other blogs) have at the bottom of your posts showing “similar clothes”. Could you please tell me something about where can I get it? Thank you so much! I wish I wasn’t so in love with these wedges, but they are gorgeous! You shine like the sun in this post ^^! Really pretty, I am looking forward to the spring season so much now! LOL! Well, the dress looks great on you! And your hubby takes beautiful photographs of you! That’s funny. My husband does my shots too and usually has a comment about one of my pieces (he thinks he’s pretty funny). I married my opposite for sure since he’s Mr. Outdoor man! Beautiful as always. LOL! That’s so funny! My husband said something similar the day while he was taking photos of me. Love the dress on you! Looks like you are having a great time in Hawaii! I personally love the colour, so bold! Ugh..these colours make me crave summer so badly! It’s -26 celcius in Montreal today so these pictures make me even more jealous! Such a fun outfit!! I love the bright yellow. So beautiful! I agree with your husband! Absolutely gorgeous!! Yellow is definitely your color!! Gorgeous as usual! I LOVE this dress. And your hubby does a FANTASTIC job photographing you! He’s an artist, tho you are an easy subject! How funny! My husband says the same types of things to me when he takes my photos. Yes, I’m sure it was a compliment! Beautiful dress and enjoy your vacation! I’m so jealous of your vacation, it’s snowing where I live! Beautiful look. oh that dress looks perfect for the beach! This is the perfect vacation dress…bright, cute & easy to wear at the end of the day (what I really mean is if you get a sunburn & anything fitted would be too painful !!) It also wouldn’t take up a lot of room is your suitcase…so you can pack more!! I just came back from Costa Rica & should have packed more dresses like this !! I absolutely love this look! Going to Costa Rica soon and need to find something like this for the trip. Gorgeous color! Neon yellow! Wow! 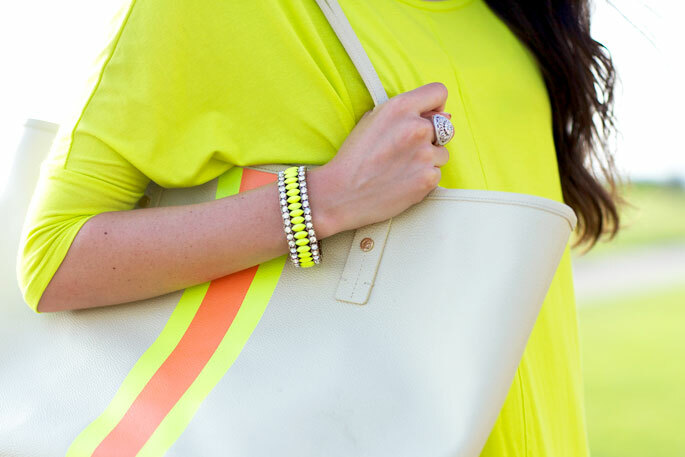 it looks gorgeous on you, so bright and fun but also chic! Neon Yellow!WOW! it looks great on you. This look is so bright and fun, but also chic, love it! Love this look. Just about to buy the dress for my Mexico baby moon. Oh my god I’m actually stupider for having read your blog. Ick. And here’s a thought: instead of prancing around photographing yourself with orphans in Nicaragua, why not sell the Goyard you brought with you and donate the money to the orphanage–which would feed all of them for a year. You’re so absolutely beyond detached from reality it’s sickening. So sad you would take the time out of your day to leave this rude and hurtful comment. I was not prancing around with orphans and I take offense to that comment. My grandma lived in an orphanage her entire childhood so I have a great respect and love for all those precious little girls. Not only did we donate our time to the orphanage but we also brought over care packages, which we paid for and we also donate money to them yearly. My husband and I also donate 10% of our gross income to charity monthly. Don’t judge. Such a beautiful color on you! Your always so stylish and such an inspiration. I am new to the blogging world and just just started my own style blog (www.simplyauna.com) I would love to email you regarding some relevant questions and get some feedback. Love the bag, shoes, and bracelet. Gorgeous. I love how bold and flowy all of your vacation ensembles are! That dress is gorgeous! Love this whole outfit! Gorgeous look! Thank you for sharing!! Perfect clothes, perfect hair & makeup, TDF shoes, a hunky photographing hubby & weather from a picture postcard; what more could one ask? Amazing everything, as always! Were you at Grand Wailea? Love it there! What a cute bag! I love C.Wonder! Love the dress! You accessorized it perfectly! Silly question, but what kind of undergarments do you wear with something like this? Whenever I wear light jersey I have issues…but yours looks perfect. Thanks!